I have been building and repairing arcade games for over five years, but have never taken the time to actually log the steps involved, until now. Just as with any hobby or trade, everyone has their own tips, tricks, preferences and recommendations. I’m no different. The following information serves as a, “how I do it”, instructional guide for building a multicade arcade game using a 138-in-1 PCB game board and a Williams Defender cabinet. The following instructions do require some basic knowledge and understanding of electronics. If it’s deemed useful to those entering the hobby or to someone looking to become even more involved, then great! At the very least, I hope you find it an engaging and attainable DIY project. (1) LCD or CRT Monitor (dimensional size is relative to the game cabinet, but for this example, I’ll be using a 19″ CRT arcade monitor). I typically build multicade arcade machines from existing game cabinets that have already been bastardized in one way or another and are usually devoid of any original artwork, parts and/or wiring harness. Case in point, a Street Fighter II conversion from a Williams Defender cabinet. Yeah, it’s not pretty, but it gets the job done! New cabinet kits are available online in both the cocktail and upright styles. Beware, these kits typically do not include any of the bare essentials such as glass, artwork, monitor, controls, wiring harness or a game board. If your looking for a game cabinet to use for a multicade, browse local resources such as Craigslist, social media outlets, auctions, and even thrift stores and pawn shops. Please note, I do not condone defacing a classic arcade cabinet, sideart, wiring harness or control panel simply to convert it into a multicade. Arcade games from the 80′s, 90′s, and 2000′s are still plentiful, so finding a cabinet for your multicade project shouldn’t be too difficult. As mentioned above, my most recent multicade project started as a 1981 Williams Defender cabinet, but was later converted in a Street Fighter II. Due to the previous conversion, it had been rewired, repainted and the control panel redesigned for additional joysticks and buttons. I obtained this cabinet from a local auction for the exact purpose of converting it into a multicade for a client. Many original arcade cabinets from the early 80′s were made from plywood, rather than particle board or Medium-density fiberboard (MDF). Plywood cabinets are always my preferred choice due to the lighter weight along with their repairability. My first step in prepping a cabinet for conversion is stripping it of all its internal and exterior parts including the monitor, control panel, coin door(s), marquee, rear access panel, t-molding, wires and paint, where applicable. DISCLAIMER: Monitors contain high-voltage and can be lethal! Before handling or attempting to repair a monitor, you must first discharge the high-voltage by using the appropriate tools. Please perform the necessary research before attempting to discharge a monitor. If you are uncertain of your ability to perform this procedure safely, please contact a professional technician. I and/or this website is not responsible for your actions. Make sure to save the parts that you may be able to reuse, such as the power supply, isolation transformer, AC line filter, fluorescent lamp assembly, speakers, grills, handles, interlock and toggle switches, leg levelers, castors, etc. Many times, these parts are still usable and will help reduce your overall project costs. TIP: Taking pictures during the breakdown process can also be an asset later on during reassembly! If you’re planning on repainting the cabinet, first remove any existing decals and/or vinyl artwork. This is also the time to patch any holes or gouges present upon the exterior of the cabinet. I recommend using a wood filler or an automotive body filler (i.e., Bondo). These compounds are fast-drying and can be sanded smooth within an hour. If you choose to sand the exterior surfaces of the cabinet down to bare wood, you’ll definitely want to invest in an electric sander. I use an orbital sander for this step. Make sure to sand in a well-ventilated area, especially if you’re using any kind of chemical stripper. This process is not only incredibly messy, but it can be potentially dangerous. Please take the necessary precautions and wear a dust mask, safety glasses and gloves. Along with the cabinet preparation, you may also want to prep your exterior metal cabinet pieces such as the coin door(s), control panel and any additional trim. If sanding is required, I typically use an electric drill with varying wire brush attachments to remove all surface rust and paint. Again, please take the necessary precautions and wear a dust mask, safety glasses and gloves. I even recommended wearing a welding apron in order to protect yourself from wire brush shards. Once you’ve finished sanding, it’s now time to start preparing the cabinet for painting. This would be a good time to re-install the leg levelers or castors in order to raise the cabinet slightly off the ground when in its upright position. If you’ve sanded the cabinet’s exterior down to bare wood, I would recommend applying a multi-surface interior/exterior primer as a first step (e.g., Kilz2 Latex). The same goes for any metal pieces such as the coin door(s) and control panel. Rust-oleum Painter’s Touch Ultra Cover 2x is my preferred choice and is available in a spray can as a primer as well as a top coat. In order to achieve a smooth and even finish on the cabinet, a paint sprayer is highly recommended. If you don’t have access to a paint sprayer, rolling your paint will work just fine. I’ve had great success using the Wooster Mohair Nap for Ultra-smooth surfaces as well as Quali-Tech Mfg Ultra Dense Foam Rollers found at Home Depot. When it comes to finding the right paint for your base coat, you have a variety of types, colors and finishes in which to choose. I prefer Sherwin Williams or Glidden acrylic latex paints with a satin finish. Add a minimum of two (2) coats for the best coverage. Also please note, if spraying your cabinet, you will use more paint, so plan accordingly. Applying a final clear coat is optional. Control panels contain the largest degree of variation for any arcade project, but can also be literally plug-and-play in many situations. Depending upon your project, you may or may not have to paint, drill holes or even apply a control panel overlay (CPO). If you’re creating a new control panel from a blank, as in my case, you’ll be doing it all. Is the current panel composed of metal or wood? If metal, a reproduction may be available online. Reproduction panels such as those used in Midway Bally games are extremely common and can be ordered with additional controller and/or button holes already stamped. With wood control panels, I prefer to use MDF or plywood for my base. Based upon the dimensions of the previous control panel, I cut my wood blank to match. I can now determine the placement of the controllers and buttons. Creating paper templates can be useful during process until the exact layout is determined and traced onto the wood blank. Once the layout is determined, a 1/8″ hole saw bit is used for joystick controllers and buttons, while a 3″ hole saw bit is used for 4″ trackballs, if applicable. Upon cutting out all necessary holes, the control panel is sanded smooth. I then add a base coat of gray primer followed by a semi-gloss black top coat using Rust-oleum Painter’s Touch Ultra Cover 2x. If you’re looking for reproduction artwork or have a custom design you would like printed for side art, CPO, bezel or marquee, there are numerous online vendors available that can meet those needs. When ordering, I make sure to specify I want an adhesive backing on all CPO’s and marquees. Before installing the CPO, clean the control panel’s surface to remove any dust or debris that may be present. Apply the CPO by positioning the vinyl overlay over the control panel’s surface and by using painter’s tape to secure the top edge of the overlay to the top edge of the control panel. Once secured, flip over the overlay and begin to peel away the top inch of wax paper across the entire length to expose the adhesive. Slowly flip the overlay back onto the control panel and begin to press the top section of the overlay onto the control panel. Continue to slowly peel the wax paper away from the backside of the overlay, while evenly pressing the overlay onto the control panel. Once the overlay is in place, you can remove the tape used to secure it. Using a hair dryer can assist in softening the vinyl and along with assisting with adhesion. If you’re concerned that adhesive on your CPO will not bond properly to your wood control panel, a plexiglass sheet can be mounted on top of the overlay and anchored in place by screws. Not only will this protect the CPO from raising, but it also serves as protectant against general wear and tear. If using a plexiglass sheet to cover the CPO, you will need to cut matching holes for the joystick controllers and buttons. NOTICE: Adding additional adhesive to the backside of the CPO such as contact cement, is not recommended and can actually damage the overlay. With the control panel facing up, I use a blade cutter to slowly and carefully cut out the joystick controller and button holes from the CPO. Extending the blade a couple of inches, follow the inner wall of each hole holding the blade as flat along the hole’s circumference. Remove any excess vinyl from the sides of the control panel as well. Once all control panel’s holes are unobstructed by the vinyl overlay, the joystick and button components can be mounted and readied for wiring. Also, make sure to install the latch hardware that was present on the bottom of the original control panel. Building a reliable power supply is vital in order to obtain the needed voltages required to power the lamps, monitor and game board. A multicade board typically require an input of only -5, +5 and +12 VDC. Please read the game board manual(s) that came with your multicade PCB to verify its required voltages. I recommend mounting the above power supply parts (#1 – #6) on a single sheet of plywood, MDF, etc., rather than directly onto the cabinet floor. Using a portable platform for the power supply’s will allow you the ease to construct the unit outside of the cabinet and will also lend to a simpler installation and removal process, if needed in the future. NOTICE: Not only is it important to use the proper wire type and gauge in your cabinet, but it’s also a necessity to abide by the standard electrical wiring colors. Using standard electrical wiring colors for hot (black), neutral (white) and ground (green) is not only recommended, but expected when wiring for AC. When wiring 120 VAC into the cabinet, use a minimum of 18 awg stranded copper wire with a voltage rating of 600 volts. Also, use plenty of cable ties and cable clamps to securely hold all your wire bundles in place throughout the cabinet. A good wiring job isn’t only aesthetically pleasing, it also serves to protect the internal wiring from damage and interference with other components. NOTICE: When building your power supply, please verify if an isolation transformer is required for your monitor! While some newer CRT monitor no longer require a separate transformer and are labeled as such, older CRT arcade monitors still do. An isolation transformer has a 120 VAC output that is “isolated” from any connection or reference to the Earth. With the neutral/earth ground connection broken, the chassis of the monitor can be safely grounded without causing damage to the monitor’s internal components or you via electric shock. LCD monitors do not require an isolation transformer. The Real Bob Robert’s has constructed an in-depth “how-to” guide that provides detailed images and illustrations in constructing an arcade power supply and wiring your cabinet with AC and DC. If you’re in need of additional assistance, click the following HELP links. When providing a central earth ground to your power supply components, it’s recommended to use a single grounding point. I typically drill a centrally-located hole through my plywood base and insert a 2″ carriage bolt. Secure the bolt in place with a hex nut and use a wingnut to secure all ground wires. At this point, the cabinet should be painted and the power supply built and tested. Re-install the leg levelers or castors, if you haven’t done so already and place the cabinet upright. Before mounting the power supply inside the cabinet and beginning the wiring process, re-install the monitor chassis, fluorescent lamp assembly, speaker, and coin door. This is also the time when I securely mount the PCB game board to the inside of the cabinet wall and connect the JAMMA harness connector to the PCB’s edge connector. It’s preferable for these items to be in place as during wiring to limit the length of your wire runs. Interlock and toggle (on/off) switches should also be installed at this time. The JAMMA (i.e., Japan Amusement Machine and Marketing Association, Inc.) wiring standard was introduced in 1985 and became the de facto world standard in the 1990′s. The standard allows compatible games literal plug-and-play capabilities within any JAMMA wired cabinet. The JAMMA standard uses a 56-pin edge connector on the board with inputs and outputs common to most arcade games. These include power inputs (+5 VDC for the game board and +12 VDC for the coin door lamps); inputs for two joysticks, each with three action buttons and one start button; analog RGB video output with negative composite sync; single-speaker sound output; and inputs for coin, service, test, and tilt. Fighting games such as Street Fighter II and X-Men use arcade boards that incorporate extra connectors or utilize unused JAMMA pins to implement extra buttons, different controller types, or support more players. These games are sometimes referred to as JAMMA+. When shopping for a harness, consider the type and number of controllers you intend to utilize as well as the number of buttons your game(s) will require. For this guide, I will simply use the acronym, JAMMA, to describe any and all JAMMA harnesses. With your JAMMA harness in hand, locate the wire bundle labeled, Power. The harness will likely contain multiple instances of the colored wires seen below. Twist the ends of the like colored wires together and crimp each set with a spade or ring wire connector. Attach the crimped wire bundles to the correct posts on the switching power supply. NOTICE: Review your harness’ wiring diagram to verify that the wire colors and pin connections are the same as above. Some wire color variations may be present, so confirm before applying power. Upon connecting the harness’ power wires to the switching power supply, securely mount the power supply platform inside the cabinet. Attach a black wire to the outbound male connector of the fuse holder and connect it to the toggle switch located within the cabinet. If you are installing one or more interlock switches within the cabinet (e.g., coin door and rear access panel), they will need to be wired in series with the power toggle switch. These switches will control the 120 VAC used to power the monitor, fluorescent lamp assembly and switching power supply. A second black wire will connect to the toggle switch and run back to the distribution block located on the power supply platform. Attach a single black and white wire to the distribution block and make runs to the fluorescent lamp assembly located within the cabinet. A 3-pin molex connector is recommended in order to connect a black, white and green ground wire to the fixture. If using an older arcade monitor, attach a separate black and white wire to each of the remaining top blanks (i.e., pins) of the isolation transformer and make runs to the monitor. A 2-pin molex connector is recommended for the final connection. If using a newer arcade monitor, a 3-pin molex connector along with a power cord may be present. Disconnect the power cord from the molex connector. Attach a separate black and white wire to the distribution block of the power supply and make a run to the monitor. 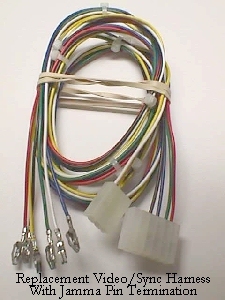 Using the 3-pin molex connector, connect the black and white wires along with a green ground wire to make the final connection.NOTICE: If the 120 VAC wires coming from your arcade monitor or fluorescent lamp assembly are both colored black, the neutral wire is usually identifiable by either a thin white stripe or a ribbed texture. Earth ground wire runs are connected to all conductive surfaces within the cabinet including the monitor chassis, fluorescent lamp assembly, speaker, control panel, coin door, etc. Be certain that ground wires have also been run to any needed molex connections such as those used in conjunction with the monitor and/or lamp assembly. To ensure the cabinet has proper earth ground, all ground wires should be securely connected to the primary grounding post located on the power supply platform. Locate the wire bundle labeled, Coin Door. The coin door lamps along with all other coin door components get their voltage and ground from the JAMMA harness. The +12 VDC line along with a ground wire will be pigtailed to each lamp’s positive and negative terminals. Additional wires for Coin 1, Coin 2, Counter, Test, etc. are also present and are optional. These components are connected in the same manner as the coin door lamps. It’s recommended that a 9-pin molex connector be used to separate the JAMMA harness from the actual coin door connections. Locate the wire pair labeled, Speaker. Make sure to properly connect the wire pair to the speaker’s positive and negative terminals. If connecting more than one speaker, connect all speakers in series making sure each speaker has matching impedance ratings (i.e., 4 ohm, 8 ohm or 16 ohms). Locate the wire bundles labeled, Player #1 and Player #2. These two bundles will contain the necessary connections for the joysticks and buttons. Each bundle also contain a loop of black ground wire that will pigtail across each button and joystick connection.NOTICE: Trackball controllers require a separate harness that plugs directly into a socket on the multicade PCB (e.g., 60-in-1). Locate the wire bundle labeled, Video. These five wires are responsible for the analog RGB video signals as well as the video ground and composite sync needed to send the video signals from your game board to the monitor. I recommend purchasing the Video/Sync Harness with Jamma Pins (http://therealbobroberts.net/parts.html) harness from Bob Roberts. This harness includes everything you need for a straight plug-and-play replacement. Before applying 120 VAC, first review the wiring! Verify that all connections have been completed properly, especially the earth grounds. Review the owner’s manual that was supplied with the multicade PCB to determine the precise voltage range needed for nominal operation of the game board. Using a multimeter, set the meter to VDC and connect the ground lead via an alligator clip to the earth ground on the power supply platform. Now place the multimeter’s positive lead on the +5 VDC post of the switching power supply. Plug in the power cord and engage the power toggle switch.120 VAC is present! Using a plastic screw driver or television tuning instrument, adjust the voltage of the switching power supply by slowly turning the trimmer pot located on the outside of its case. Set the voltage to the range specified within the PCB manual. At this time, the cabinet’s marquee light and coin door lamps should be illuminated. The monitor should be also active with high voltage (HV) and displaying a multicade menu or splash screen. Audio may or may not be present due to default settings or the volume control trimmer pot. It’s likely, when using an older arcade monitor with a modern multicade board, that additional monitor adjustments will be required. If horizontal width adjustments are needed, that the horizontal width control cannot resolve, you may need to swap out the width capacitor on the monitor chassis board until you get the correct screen size. This is a common occurrence and one that I have performed numerous times in conjunction with 138-in-1 boards and 25″ CRT standard resolution monitors. Additional settings can be performed via the trimmer pots that are present on the monitor chassis and neck board. Using a plastic screw driver or television tuning instrument, is recommended to prevent being shock or damaging monitor components. Always take extreme caution when working with a live monitor! Before attempting to make monitor adjustments, please download the official user manual for your monitor type. Monitor documentation can be easily found by searching online. We’re on the home stretch, but still have some work ahead of us in the way of finishing touches; installing the bezel, marquee, side art and t-molding. If you haven’t done so already, add new cam locks to the coin door(s) and rear access panel. Identically keyed locks are available online and eliminate the hassle of having unique keys for each of your arcade cabinets. Marquees can be printed on vinyl with or without an adhesive backing or printed directly onto acrylic. If applying a vinyl marquee that contains an adhesive backing, use the same installation procedure as specified for a CPO. I’ve had great success using this technique for both vinyl marquees and CPO’s. If you’re installing kickplate or side art on your cabinet, you have two installation methods that can make the task slightly less intimidating; the dry or wet method. The following instructional videos provide some useful advice and tips for successful application. T-molding can be purchased by the foot and comes in a variety of colors and alternate widths, so measure the cabinet’s routed edges to determine the appropriate molding size. Using a rubber mallet, slowly work your way around the exterior edges of the cabinet, inserting the molding into the routed groove. If the groove is too wide or will not hold the t-molding tightly, apply a small amount of hot glue to secure it. When applying molding to corners, use a razor knife to carefully slice into the underside “T” of the molding to make it more malleable. Upon completion, clean the glass, wipe down the cabinet and POWER ON!